Prague. We are all just walking each other home. You are what you love, not who loves you. Happy May! Even as I am buried in outlining for final exams, recovering from strep throat, and preparing for a summer abroad in Uganda (! ), I find myself reminiscing hard about this week last year–when I left NYC for 3.5 months backpacking around the world! However, after I got home and curled up under my electric blanket with a mug of tea, I found myself realizing that it was, in fact, almost the end of Valentine’s Day 2017. So I decided to recognize the holiday with a little reflection on self-love. Last year was the best year of my life in so many ways, but I feel like it was perhaps only setting me up for the year that is ahead. I am so excited to the point I am almost restless for the next few months. Below I’ve made a “list of love” to share the ways I’ve practiced self-love so far in 2017. It doesn’t matter if you’re coupled or single as a pringle—today is also a day to realize you need to love yourself before you can truly love anyone else. 1- Travel! I feel so, so lucky (more so each day) that I am able to continue my traveling this year. I’ve realized over the adventures of the last few years that travel is my first love. I feel fully alive when I am somewhere I’ve never been before. I started off 2017 with a trip home to the South (which honestly feels like visiting another country sometimes) before spending 10 days in Costa Rica. Next month, I am traveling to Israel with a group from NYU Law. We had our first meeting together last night, and I can’t wait to explore with this group next month! Then, I will be spending 10 weeks in Uganda over the summer as a human rights fellow through law school. And, I may be doing a 10 day safari in Botswana before I start! I feel so grateful to be able to continue doing what I love in the context of my career, education, and research interests. It’s good to have a taste for traveling alone. A shot from last month in beautiful Mexico City. I can’t wait to be on the road again! 3- DailyOm. DailyOm is a website that offers online journaling classes with a variety of focuses. Because I love writing so much (if you can’t tell already! ), I decided to give their strategy of “focused journaling” a try through their course entitled “Heal Yourself With Writing.” The course centers on self-discovery and empowerment by writing and remembering the past from various perspectives. The course starts off with a Native American parable about a man who says he feels he has two wolves fighting in his heart—one vengeful and angry, and the other loving and compassionate. The man admits that the wolf who wins will be the wolf that he feeds, and he chooses which one is fed. I’ve found the approach to remembering, refocusing, and writing to be transformational, and I am just a few weeks in. Whether it’s writing, meditation, or another mechanism, I would encourage everyone to take some time for self-reflection now—especially as the world seems to spiral into chaos around us. The new website I have replaced Facebook with! 4- A fresh approach to law school. The first semester of law school really was a blur to me. I hate to admit this, but I feel like I just showed up and went along for the ride when I returned from traveling back in August. I don’t think I got enough out of this education I am investing so dearly in last semester. This semester, I feel not only more focused, but more knowledgeable about what I need to do to get the most out of law school. For me, that means 1-handwriting all notes (no computer! ), 2- hitting the library everyday (no more going home early, chilling, and getting distracted! ), and 3- briefing all my cases (I didn’t think it was worth it last semester, but I’ve changed my mind). A nice snowy day recently at NYU. I feel a lot more grounded and connected to school this semester, and I am happy I get to come here everyday. 5- Be careful who you prioritize. As Maya Angelou once said, “Never make someone a priority when all you are to them is an option.” The corollary, I think, would be to be sure to prioritize those people who are important to you so they never have to guess if they are priorities or options. I think this applies to all levels and forms of relationships—friends, family, and dating. For some reason, acting on this lesson of prioritization has become a “priority” for me in the last few months (for lack of a better term!). Not only am I trying to be more discerning about the level of importance I give people in my mind, schedule, and heart, but I am trying to be more intentional in staying connected in certain relationships and establishing firm boundaries in others. After all, if you don’t guard your heart, who will? 6- Take a lot of walks. Those of you who know me well know I used to be adamant about running almost everyday. These days, I like to take walks around Bushwick just about every night. I use this time to think, listen to music, and call friends. There is something about forward motion that’s freeing, no matter what speed you’re going. I surprisingly don’t miss running at all, and that’s ok–there’s a time in life for everything! I love wandering around, both in big ways (see #1) and small ways (walking around Bushwick). And, it helps me accomplish #5 (staying in touch with friends). 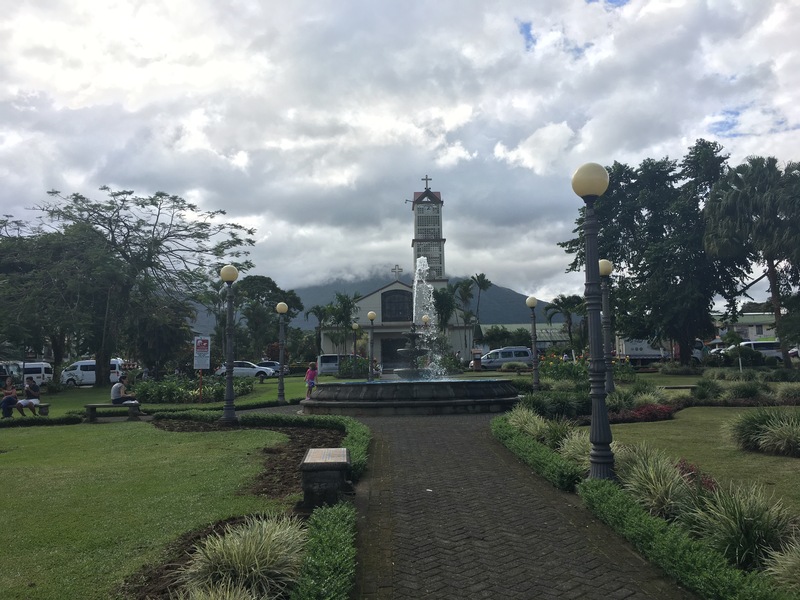 I opted to travel from Monteverde to La Fortuna via the “jeep-boat-jeep” method, which is an overland vehicle out of Monteverde, a boat ride along Arenal Lake beneath the volcano, then another car ride into town. At a cost of $25 and travel time of only 3 hours, this travel method made sense as compared to all day on the public bus. It turned out to offer some amazing views, and was so much fun! I met other travelers from Mexico, Israel, Australia, and the Netherlands. With some Australian friends/a fellow law student from the boat! 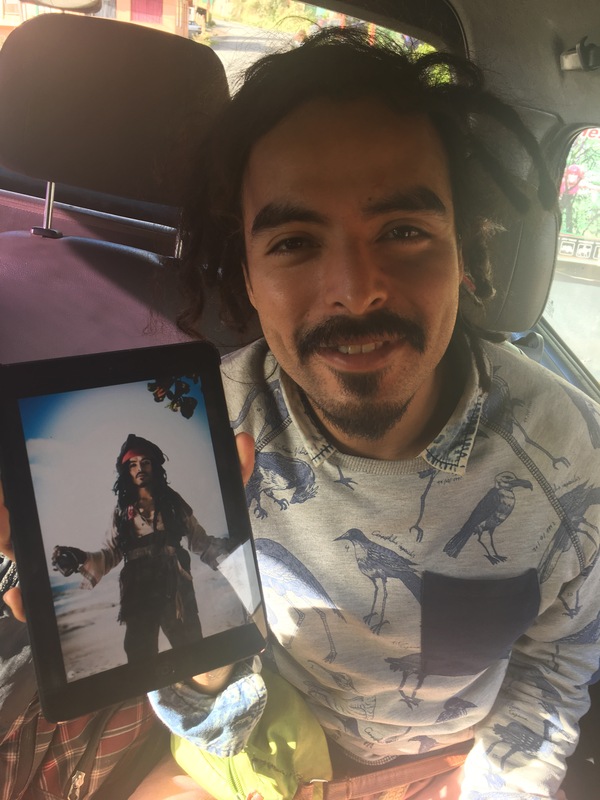 In particular, I met Gustavo, a guy from Mexico City who has been traveling for 2 years straight now and finances his travels by impersonating Captain Jack Sparrow and collecting tips. He lost his phone 4 months ago and decided he didn’t need one, and has been living without one ever since. He is the definition of a free spirit, and he provided so much entertainment on our journey! 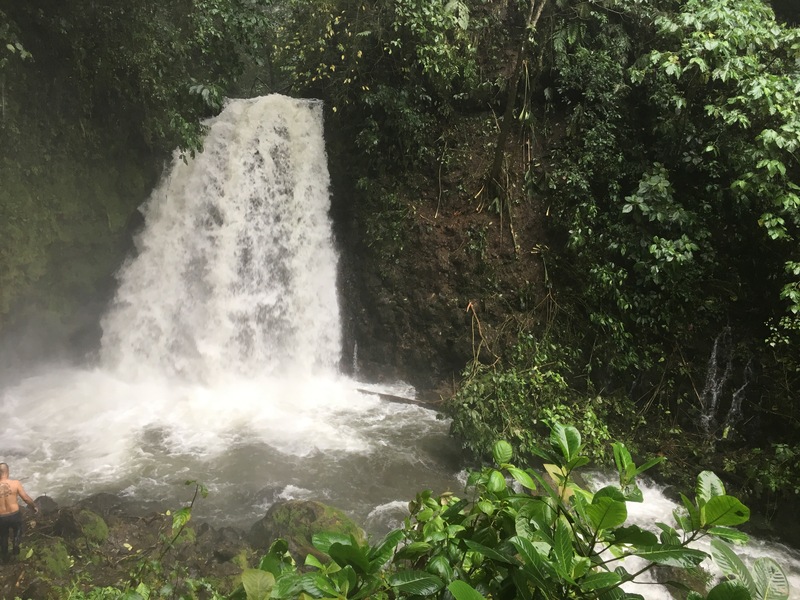 Once we arrived in La Fortuna, I checked into Mayol Lodge and spent some time lounging by the pool, writing, and checking out the beautiful river and waterfall located on the property. I also booked an “extreme 2 volcano trek” with the receptionist for the next day. 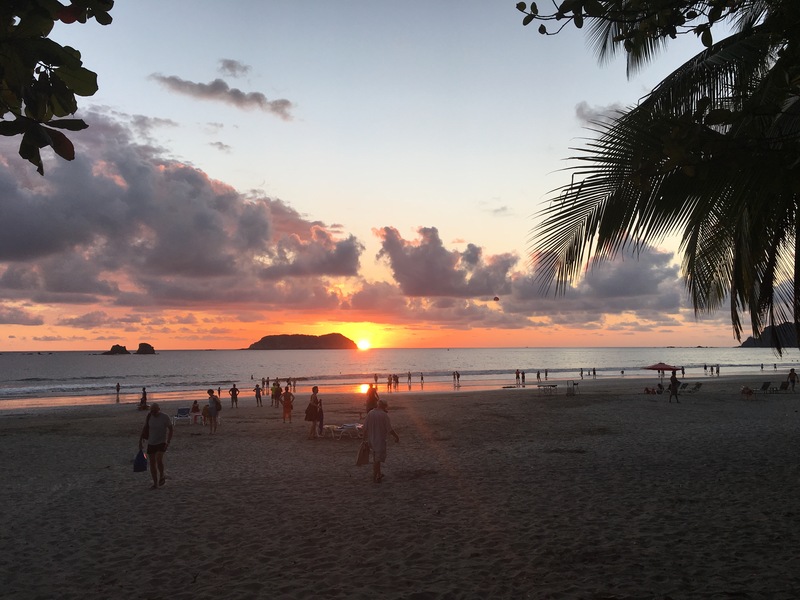 A friend back in Manuel Antonio had recommended Red Lava tours for $75, but the receptionist offered me a deal with a locally-owned company for $60. The next morning, I set off on the trek with our 2 guides, and a group of both solo and couple travelers from Australia, Canada, and Germany. I was also so excited to finally meet 3 other travelers from NYC, including another girl traveling solo like me! We ended up having some great conversations over the course of the day about life, travel, and living in NYC. 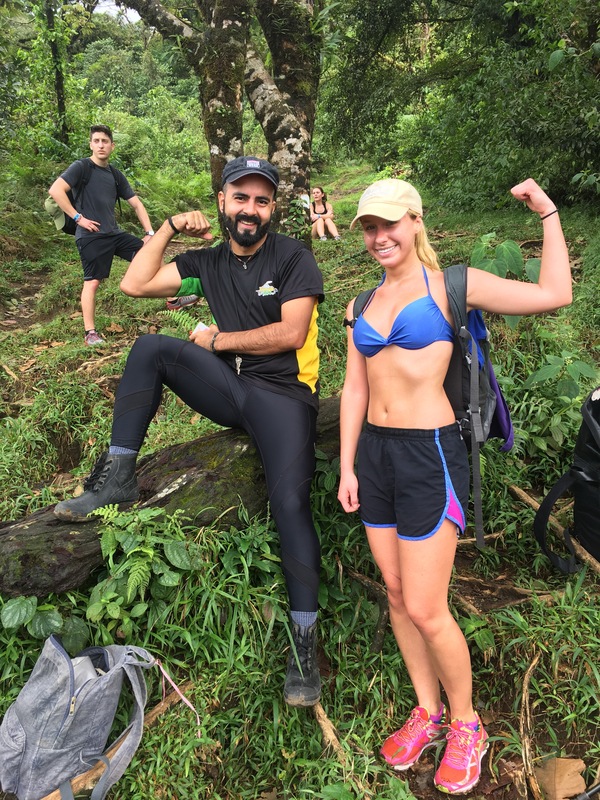 The 10-hour trek kicked off with a 2.5 hour hike up Chato, which is a smaller volcano beside Arenal without a top. Instead, a massive cater and lagoon exist at the top of the volcano. The hike started off as difficult but manageable. We were going at a pretty steep incline, using hands to grab rocks and roots for balance and leverage along the way. There was no trail- we just followed a downhill path carved out by water flow. The trail up Chato. This all became mud once the rain started! Then the rain started about halfway up Chato, and it didn’t stop for the rest of the day. We reached the top of the crater, and had to walk another kilometer around the edge to reach the point where we would descend 100 meters down to the lake. The mud situation got serious, and I was up to my ankles a few times and almost lost my shoe due to the suction once! The real challenge began when we descended down to the lagoon by sliding and climbing on all fours down the slick rocks. “It’s better to have mud on your a** than in your face,” our guide Juan advised. Once at the lagoon, the rain intensified and the already poor visibility decreased even more. I did wade out into the water with some of my NYC friends, only to wash some mud off, as the temperature had also dropped. 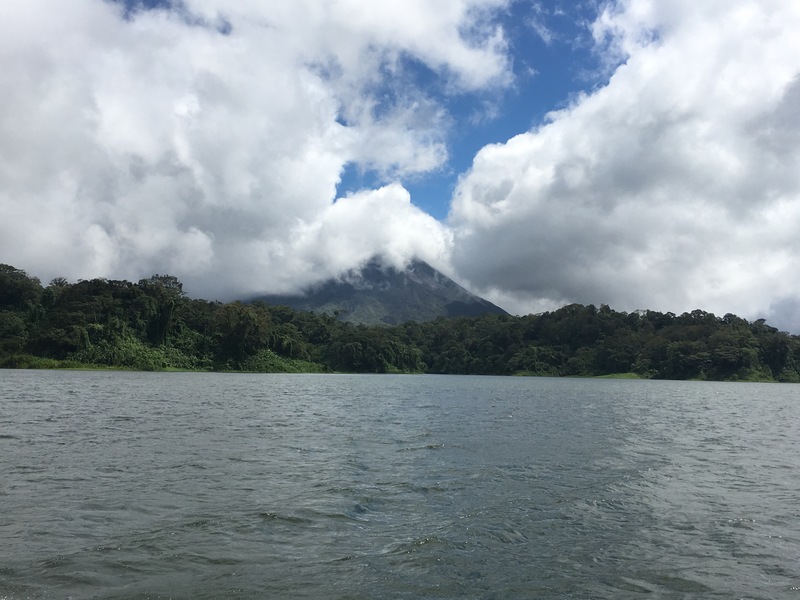 Sadly, we couldn’t see any of the beautiful views of the crater and Arenal given the weather, but I know it was all there just beyond the rain! 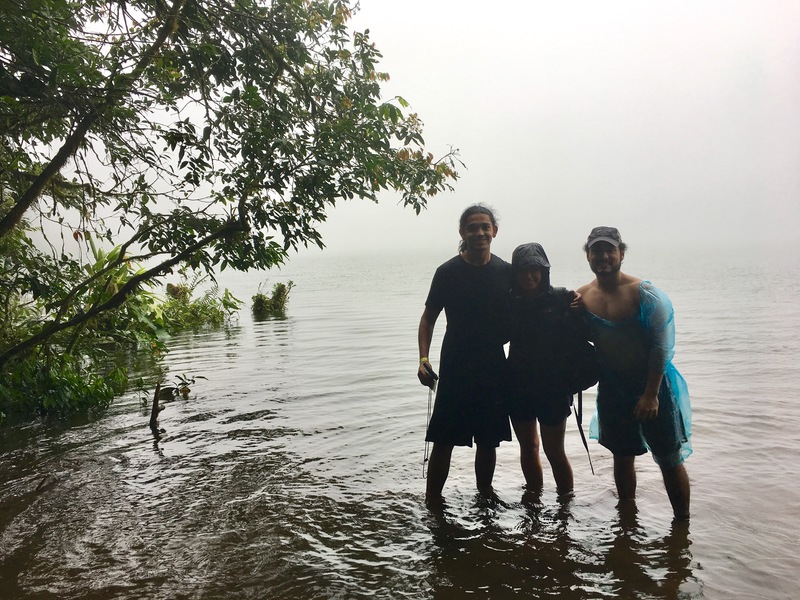 You can’t tell, but we’re standing in a lagoon on top of the volcano Chato. We then ascended the 100 meters out of the crater to continue around Chato and descend the volcano on the other side toward Arenal. Just as it had been tricky descending the 100 meters on the slick rocks in the mud, it was equally as challenging climbing out the same way. I used roots and branches to pull myself up particularly tall rocks. My plan was working well, until a few minutes in when my foot slipped on a rock just as I was dangling from a branch. My left thigh crashed into the rock as I fell just 2 feet, but it was enough to hurt a lot! Sure enough, I had a pretty big (but fortunately shallow) scrape on my left thigh, and the blood started flowing. I had no choice but to keep climbing, as we were in the middle of a cliff. All of my fellow hikers were so sweet and offered to help me, and one new NYC friend used his water to clean the wound. As the blood kept flowing, I waited for Juan once I reached the top, and he was able to clean the wound with alcohol and wrap my leg in gauze to keep all the mud out. I have to say I felt super tough at this point! 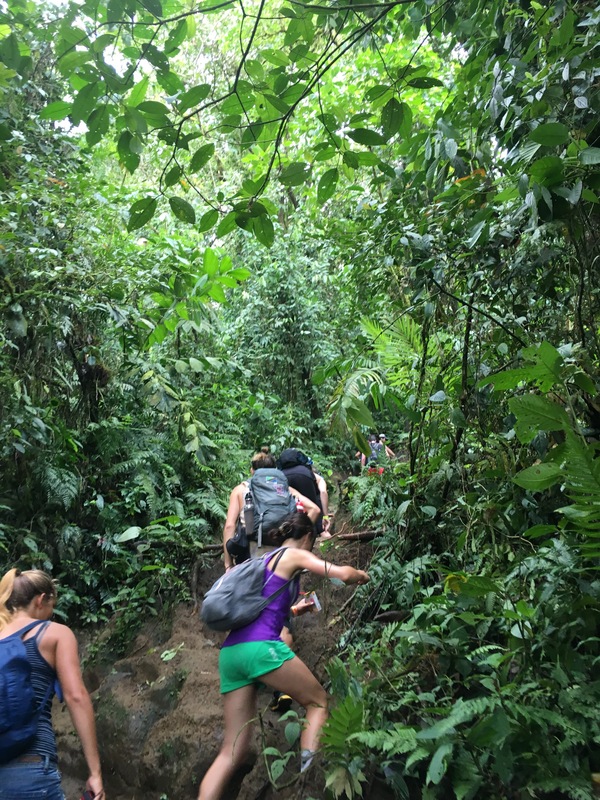 We continued the hike down Chato to then hike around Arenal to some waterfalls and hanging bridges for another 3 hours. Juan kept a close eye on me to make sure I didn’t have any other accidents (haha). 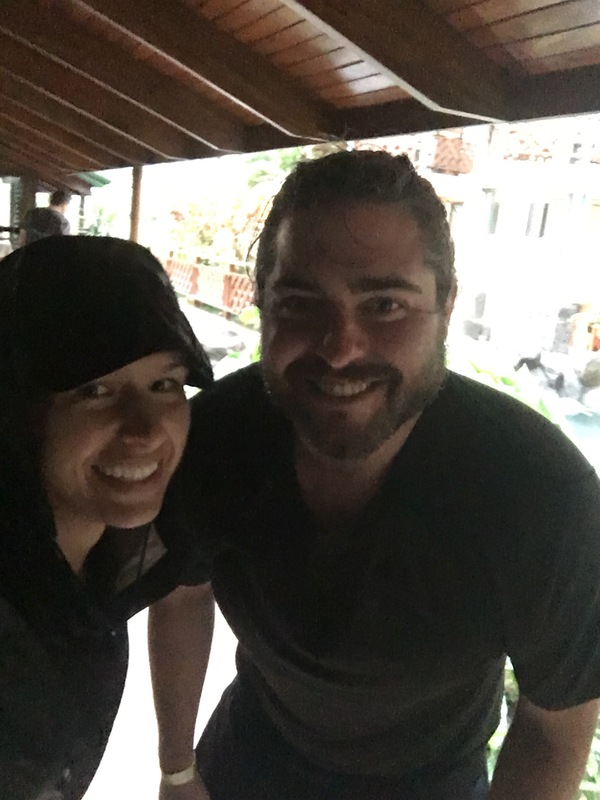 Even as the rain continued to pour, we all kept ourselves in good spirits by laughing and joking about the insanity of the situation. In particular, my new Canadian friend Matt made me laugh so much the rest of the afternoon that I forgot I was cold, wet, and bleeding. It was actually fun! We found a river to wash off in, and a waterfall. 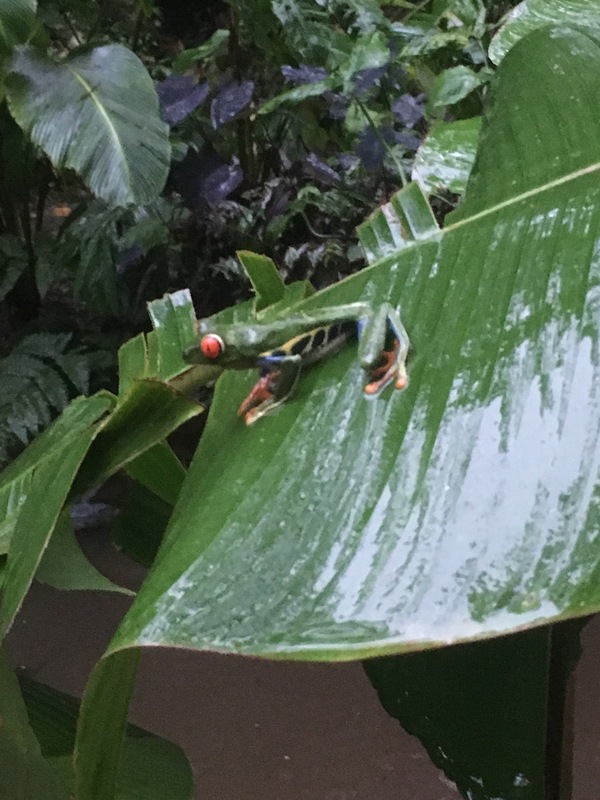 We even saw a tree frog in the pouring rain. So cute! This is real, not fake, I promise! After a few more hours of hiking, we reached the Arenal observatory around 6:30pm. Sadly, we could not see Arenal at all. Instead, I stood under the hand dryer in the bathroom to try to warm up and dry off (this was the first shelter we had all day!) Juan also gave us coffee! Then, we loaded up in a bus and rode over to some natural hot springs, where we soaked our sore (and injured) muscles and floated. We also enjoyed some Costa Rican cocktails at this point, as well as a volcanic mud facial. It was the perfect ending to the day. Last night, after I showered and as I fell asleep in clean, dry clothes, I thought about what a wild day it had been and realized I had never been more thankful to be in a dry, warm shelter in my life. I felt very fortunate. I also felt fortunate to have met such fun, adventurous, and hilarious people from around the world on the trek. 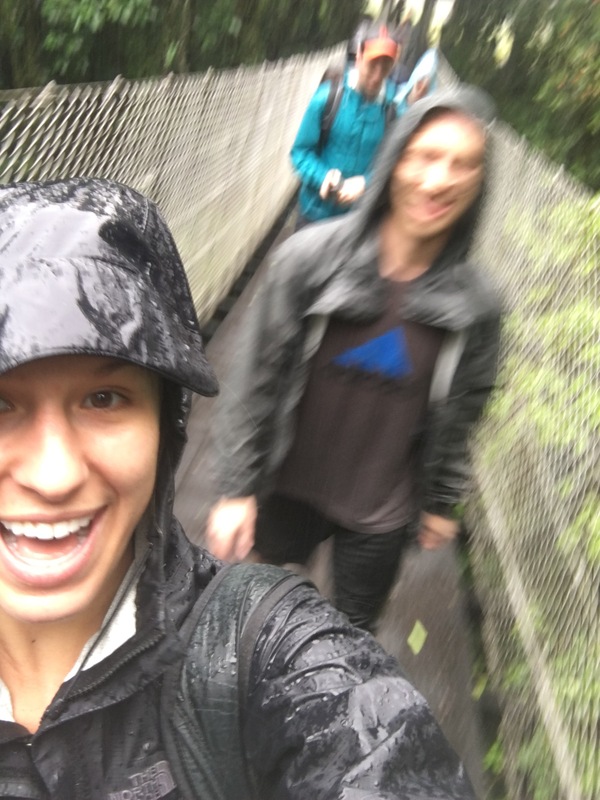 We all had so much time to chat, commiserate, and share life stories as we trekked through the rain and mud for what felt like an endless amount of hours. Lastly, I felt fortunate that I didn’t hurt myself that badly when falling down the rock, that Juan had a first aid kit on hand, and that I was able to continue the trek and have a great day. I’ve had a few close calls on this trip, so I’m more than ready to return home to NYC at this point. That’s not to say I didn’t love the jungle! Similar to when Sarah, Rachele, and I trekked Vinicunca mountain in Peru back in June, I feel like I pushed myself to a new limit and proved my own strength to myself on yesterday’s trek. At a point in my life where my days are usually characterized by a conflated stream of words from the cases I read and lecture notes I take, it was cathartic to get super dirty while hiking and climbing to the point exhaustion. This morning, I woke up and felt like I had been hit by a truck. But I also felt fortunate, and that’s Pura Vida. 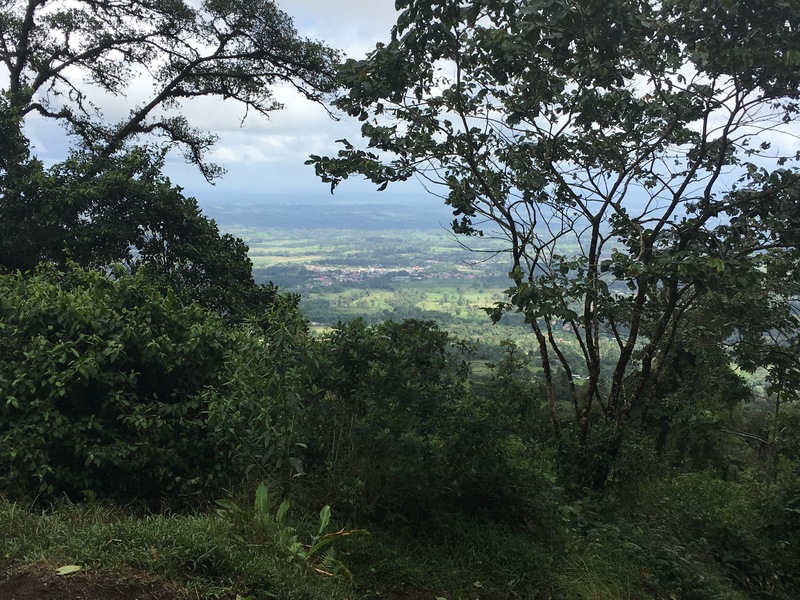 The view of La Fortuna from halfway up Chato. 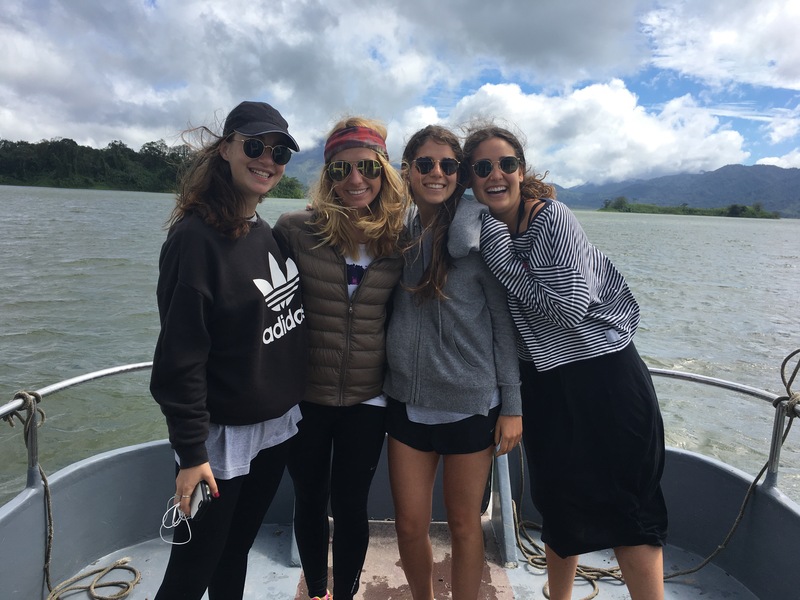 Traveling through Costa Rica over the past week has brought back so many emotions from my 12 week backpacking trip this past summer- the feelings of self-reliance and freedom, and the excitement of discovery and uncertainty. This time around, I strangely feel more at home “on the road,” but also further away from home than I ever have felt before. I find myself thinking less about how exciting the adventure is and more about how my traveling fits into my personal long and short-term goals. For me, I think I’m working on defining what home means, and I think there’s no better way to do this than traveling solo. Particularly, women traveling alone may face a unique set of questions, coming both from others and from their own self-doubt. I address a few below. 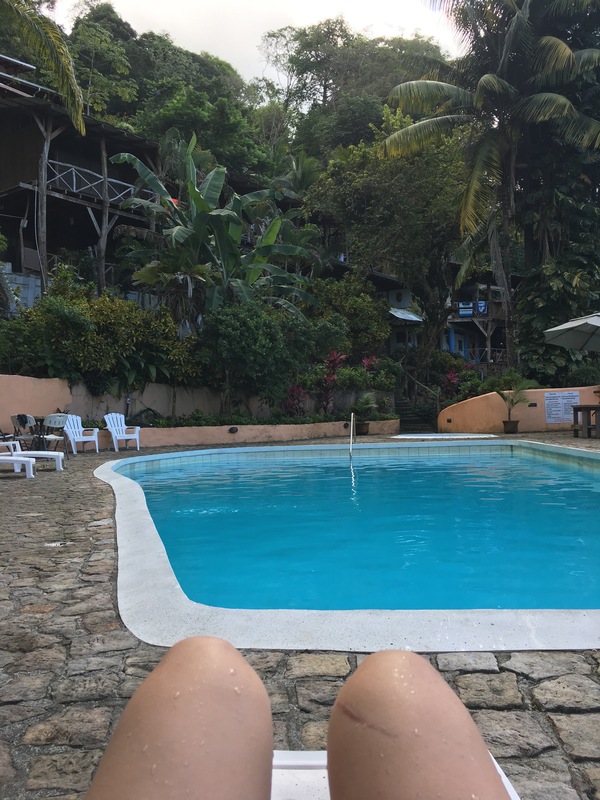 1- “It’s bold of you to be traveling alone as a girl.” I got this exact comment from a very nice Floridian gentleman I met at Manuel Antonio a few days ago, who had just finished telling me his own son had traveled through Africa alone when he was my age. I couldn’t help but smile and wonder if the fact I was traveling solo would have elicited the same response if I were male. To be fair, this gentleman was with his college-aged daughter, and he encouraged the two of us to talk some more so she could “learn from me,” which I found humbling (he thinks I have something to teach!?) and inspiring (he wants his daughter to feel empowered to see the world on her own volition). Traveling solo while female isn’t necessarily bold or out-of-the-ordinary (at least it shouldn’t be). I have girl friends from Europe who do this type of thing regularly. And let’s not forget American pop culture icons Elizabeth Gilbert (of Eat Pray Love fame) and Cheryl Strayed (Wild). I found this encounter illustrative of something I view as a uniquely American perspective– the world’s not safe enough for women to travel alone. I have to disagree. To be fair, my own parents were reasonably concerned when I traveled to Africa last year on my own. But the truth is, practicing a certain level of care and attention will keep women just as safe as men in most places in the world. I’ll admit there are some places even I wouldn’t travel alone right now, but they’re few and far between. You have to accept 1 thing (America is just as dangerous or, in some ways, more dangerous than some places in the world) and believe 2 things: 1-despite what the media shows, most people generally have goodness in their hearts, and 2-practicing heightened care by paying attention to surroundings and instincts goes a long way. A *solo* coconut lunch in Costa Rica. Muy rico! 2- “You’re staying in a hostel!? / Aren’t those sketchy and gross?” They’re awesome, if you pick the right one! I’m actually a huge fan of hostels, yet I feel they get a bad wrap in the USA because they’re just not as common there. Despite the sound of the name, I’ve found “hostels” to be quite hospitable places. Many of them are just as nice or nicer than hotels, with the added bonus of meeting fellow travelers and making friends more easily. The average age is somewhere between 23 to 35, if you pick the right one. And they are generally far less expensive to boot, with special deals on stuff to see and do around town. In addition, many hostels have a private room option which provides the privacy benefit of hotels at a far cheaper cost. Ironically, I feel hostels are a much safer option for female solo travelers than single Airbnbs or hotels. As much as I love Airbnb, I think it’s better to be around a group of fellow travelers if you’re traveling alone. Also, it’s just an easier and more convenient way to make friends! 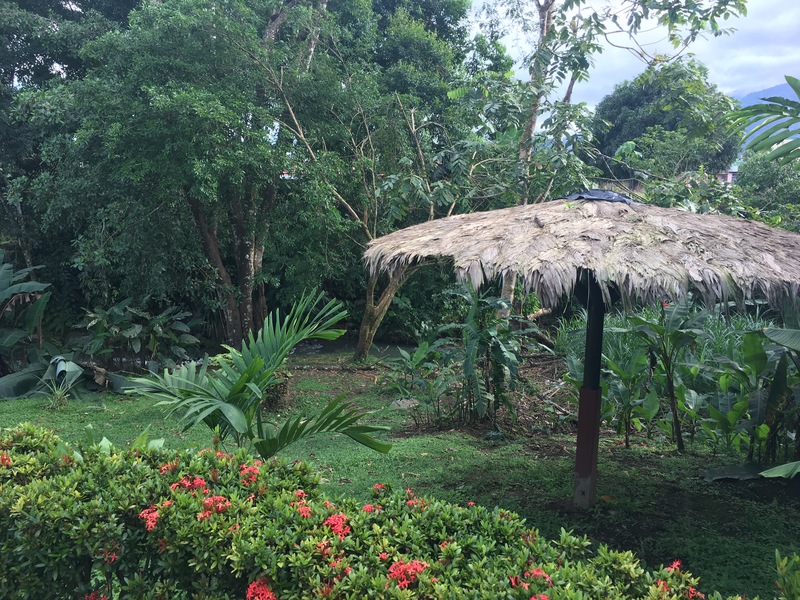 My hostel in La Fortuna, complete with a pool, river, and waterfall. At $15/night. I think my favorite hostel I’ve ever stayed in was St. Christopher’s Inn in Berlin. I stayed in a huge room with 3 other girls, one who became one of my closest friends from the summer. We also had 2 full baths, a living room and kitchen, and a full bar and restaurant downstairs. It was also next to 2 major train stations. And it was ridiculously cheap– if you’re going to Berlin, book in advance because it fills up fast. 3- “Doesn’t it get lonely sometimes?” Yes and no. I am a firm believer that everyone would benefit from taking a solo trip at some point in his or her life. Solo travel teaches you how to rely on yourself in a completely unique way, as you are often the only person you know when you first arrive in a completely new part of the world. Solo travel is a healthy exercise in self-reliance, and I’m convinced it teaches you more about yourself than you thought you could know. It also forces you to step outside your comfort zone to make new connections, causing you to realize your comfort zone is in fact larger than you ever realized. That being said, I think it takes a special blend of introversion and extroversion to truly relish the experience, as I tend to do. I am admittedly an introverted extrovert, which means I tend to gravitate towards social settings and being around other people, but I not only crave, but need, time alone to recharge and reflect. I love traveling solo because I can direct when I want to be social and when I want to be alone, which is a luxury for someone who lives in one of the most crowded cities in the world! Does it get lonely sometimes? Sure, sometimes. And I have to admit I also love traveling with other people, too. It’s just a different experience, and there is a lot of value to be recognized in both methods. I don’t think I’ll travel solo forever, but at this point in my life I’m relishing the freedom. It’s easier than you think to meet new friends while traveling solo! 4- “Why travel so much now? Don’t you want to wait and do it someday with a husband and kids?” My response is why not travel now and then! The (morbid) truth is, none of us know how many hours we have left on this earth. Or, you may wake up one day at 80 years old and realize you never pursued your dream of seeing the world because you kept waiting on other people. So if seeing as much of the world as possible is a priority to you, do it now. Not only is it safe and practical for women to solo travel (for reasons discussed above), but it makes so much sense to do so during the free, uncommitted days of early adulthood. You can stay in hostels! You can take an overnight bus with your backpack! You can wander through a jungle by yourself! 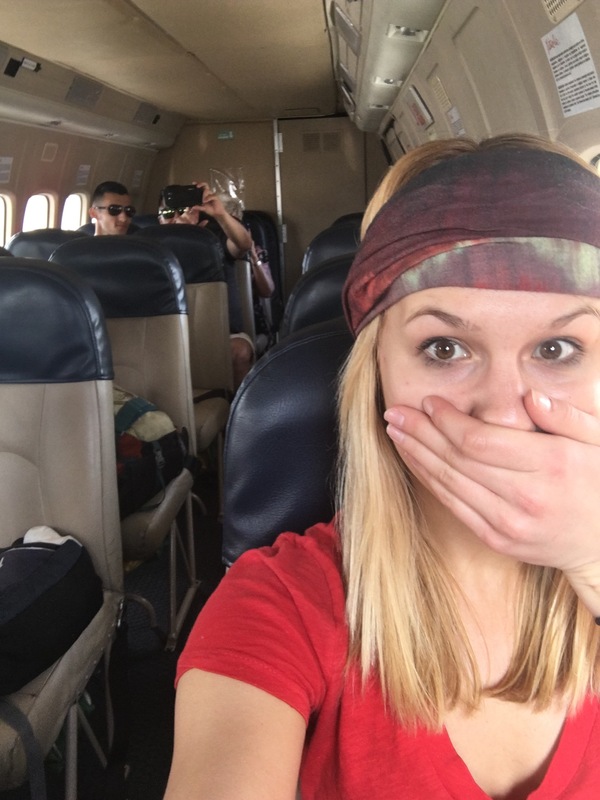 Flying in a tiny plane, aka an opportunity to be brave on my own! Traveling has allowed me to make sense of both the world and myself on a deeper level, even as what I see and learn often uncovers even more questions. I feel richer because of the opportunities I’ve had over the last couple of years to travel solo, and these experiences will enrich my future, whatever it holds. 5- “Isn’t it expensive though?” To be fair, this applies to guys and girls. My answer is twofold- 1) it’s not as expensive as you may think and 2) it doesn’t have to be as expensive as you think. Budgeting and using a savings plan, being flexible with flight dates, replacing some eating out with groceries, and using hostels can combine to make (almost) any trip a reality. Everyone has a right to choose what they value most, and for me, in the last few years I’ve begun to value experiences more than things. (That doesn’t mean wanting to spend money on nice things is a less worthy goal at all! It’s all personal preference). Life is all about choices anyway. If you want, feel free to message me to chat privately about travel finances. I promise I’ve paid less for this trip than you’d believe, and I’d love to share my secrets with you! 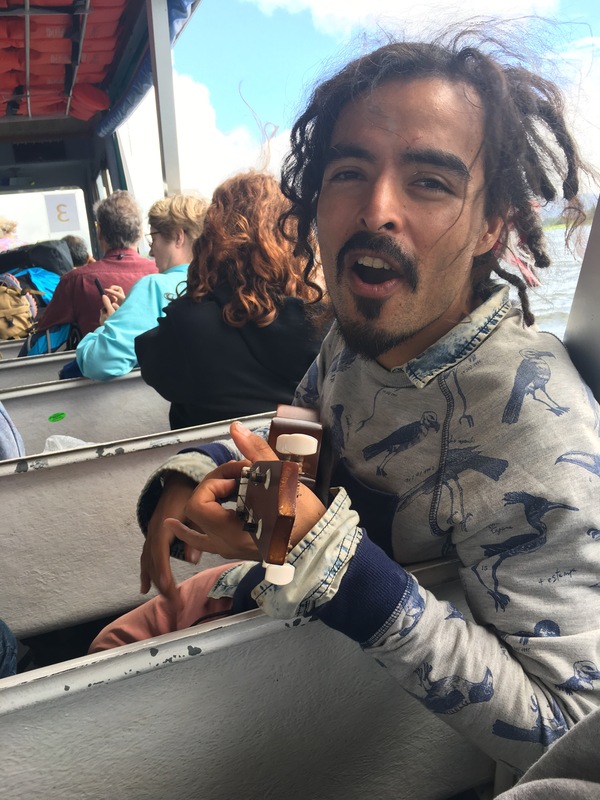 My friend Gustavo has been traveling for 2 years now, and finances his travels by impersonating Captain Jack Sparrow and collecting tips along the way! Also, each time I travel, I’m blown away by how many Americans I do not meet. For people from other countries (Australia and the U.K. come to mind), traveling abroad is a priority that manifests in the way people save and spend their money. Most people I meet traveling are not extremely wealthy, yet they just prioritize traveling in their finances. And, so many countries are cheaper to live in and travel in than the USA- with a bit of financial planning, I’m convinced more Americans can see the world. If you take the chance to travel alone, you’ll discover you’re stronger than you ever realized, meet some of the most interesting people, and learn just how small the world really is. The world is yours to explore, so I encourage all women (and men) out there to not make any more excuses and do it. To combine two of my favorite cliches- fortune favors the bold, and travel is the only thing you buy that makes you richer. It is hard to believe I’ve been home for exactly a month as of today. Moving to Brooklyn and starting law school at NYU has brought its own set of adventures (or misadventures). I’m thankful that I’ve had so much to keep me occupied and from feeling “homesick” for traveling. Although I’ve been very busy catching up with old friends, moving and settling in to my new apartment, and getting to know my new best friends (some substantially-sized Contracts, Torts, and Civil Procedure textbooks) really well, I am already counting down to my next trip (yep, it’s already in the works). I can’t wait! The busy streets of Hanoi…I can’t wait to return to Asia, hopefully sometime soon! I’ve received many messages and questions since my return about how to plan and execute a long-term backpacking trip. 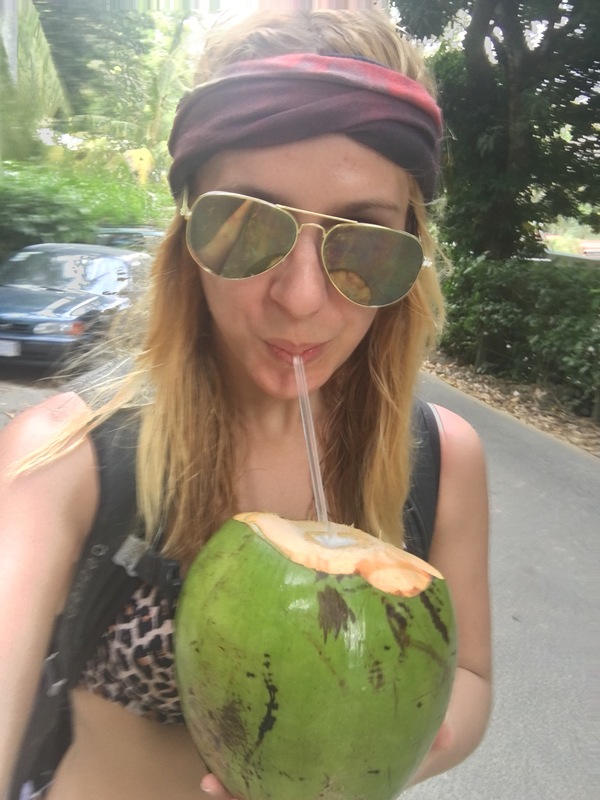 These amazing questions have inspired this post–what I know now that I wish I knew when I first set out for Thailand in May. I hope this post is helpful for those of you planning your own trips, and I am of course more than happy to keep answering questions via message (I’ll try my best to respond in a timely manner). 1- There is a lot that can (and will) go wrong. Jump in anyway. Case in point–my bag was lost for 3 weeks. Ok, maybe it’s good that I didn’t know this would happen before going, as this is the kind of thing that would have stressed me out before. This circumstance actually taught me even more that stuff is just stuff, and I don’t need all of it anyway. If I had to do it over again, I would not change a thing! 2- Don’t overplan— draft the outline but don’t write the paper before you leave. Plan a few big things, like flights and lodging in places where it may be expensive and booked up early, but try to leave as many of your plans as flexible as possible. I felt a little frustrated on my tour in Cambodia and Vietnam at some points, as I felt almost every hour was planned and structured in certain cities without room to wander. On the other hand, I feel I planned my Europe trip to the best degree possible, as I used flexible booking on Hostelworld (which allowed me to cancel reservations and get my deposit back to use towards another hostel), and I waited to book my transportation until a few days in advance of each place. This way, I could spend more or less time in places as I felt led to do so. Also, this flexibility allowed me to visit some places that were not on my original plan, like Provence with Nat and Bratislava. Book a few key things to have peace of mind, but allow yourself the freedom to drift and wander as you go along. Provence was one of the highlights of my summer…and it was never in the original plan. I was only able to go because I stayed flexible and didn’t overplan in the beginning. 3- In Europe, bus> train. I had such a great experience with the bus in Europe (with the exception of Post Bus… Don’t use them!) I used Flixbus and Regiojet to get from point A to B often, and I only used the train once (from Prague to Budapest… At only 30 euro it was well worth it!) The bus is not only far cheaper 9 times out of 10, but it takes an equal or only slightly longer amount of travel time as the train in most instances. Hard to believe, right!? I thought I’d be using the train to travel within Europe as I started my trip, but I’m so happy I discovered Flixbus and Regiojet! I used GoEuro.com to compare prices across transportation methods. 4-“You are supposed to sleep on the sleeper trains in Vietnam” (or, find moments of comfort in uncomfortable situations). Those of you who know me well know that I have germophobic tendencies. The Vietnamese sleeper trains were not the cleanest, and I took 3 journeys on them ranging between 8 and 14 hours each. My sheets had sketchy stains on them, and I didn’t even use the toilet the first 2 trips because I was so grossed out. However, I had the deepest and soundest sleep of the whole Asia portion of my trip on these overnight journeys. The secret is that I let go of things out of my control and decided to embrace the moment. I not only survived the sleeper trains, but I have great memories from them now! I applied this principle to surviving 3 days in the freezing Bolivian wilderness without a shower, as well as sleeping in a cramped hostel in Paris (it was a great location and price though, and my bunk bed had a beautiful skylight!) It’s inevitable you’ll be out of your comfort zone at certain points… Just embrace it, and it’ll become a part of your story. The accommodation in the Mekong Delta (Vietnam) provided great memories..even with mosquitoes, a tarantula, and rats! 5- Don’t go to Bolivia during their winter (our summer). It’s absolutely freezing. Having dinner in 16 degree Fahrenheit weather in Bolivia near the Chilean border…no heat! Perhaps the coldest night of my life. 6- Embrace being a tourist. You’re not gonna fool anyone into thinking you’re a local in most places. So own it… Just don’t be obnoxious. Pay the 100,000 dong to see the water puppets in Ha Noi (I unexpectedly loved this so much!) Pay the 3 sols to take a picture with the baby llamas in Peru. Pay the 18 euro for the “Heineken experience” in Amsterdam… Cheesy but amazingly fun! There is something to be said for having authentic and “local” experiences too, and I highly encourage this. But, at the end of the day, don’t be ashamed or afraid to play tourist. 7- There’s no shame in embracing a Starbucks or McDonald’s along the way. Many travelers aim for the fully “authentic” experience and refuse to patronize places like Starbucks and McDonald’s that “you can find at home” and are run by big corporations. I agree with this view to an extent–I really enjoyed discovering and frequenting local spots along the way on all 3 continents. However, I do take exception to the self-righteousness of the “authentic only” perspective. There is something to be said about finding familiarity along the way on a long-term journey. McDonald’s are actually very clean and posh (ironically) everywhere but in the USA, and Starbucks had the most consistently reliable Wifi I found. You are the captain of your own experience–don’t cave to pressure to be “authentic” because you decide what is authentic for you. 8- Have cushion in your budget. See #1. You need to plan for some things to go wrong and for some things to cost more than you’ve planned. Build some extra funds into your budget to cover these unexpected costs. For me, this was replacing my entire bag and wardrobe in Provence. Although my insurance will reimburse me, I still had to front this cost plus 3 additional weeks of travel. I’m glad I planned ahead for the unforeseen! 9- If you have a chance to travel, take it. If you don’t, make a plan. You will never have enough time, money, or friends to travel with. So do it now. Don’t make any more excuses. Plan and arrange your finances and vacation time/transition time between jobs to allow for your trip. It’s now or never! Also, don’t be afraid to go it alone. See #11. 10- A smile is understood in every language. A simple smile goes a long way in terms of making friends. Celebrating my birthday with the locals near Vinicunca Mountain in Peru was one of the most special memories from this summer! 11- Keep an open mind when it comes to the people you will meet. You may feel like your life is already so full of friends and family before you leave, but there is always room for more. The thought of traveling alone and meeting strangers may sound extremely intimidating, and that’s normal. But the truth is you’re never alone when you travel solo. You will meet so many like-minded adventurers and kindred spirits. You may fall in love. You will meet people with different backgrounds from different cultures, but discover you have so much in common. Embrace the uncertainty, wear a smile, and see where the journey takes you. The oldest farming couple in Hoi An, Vietnam. They regularly welcome visitors to their farm. This summer changed my perspective in ways I could not have predicted. Most of all, I realized how interconnected we all are on this planet, which inevitably has further influenced how I think in terms of everything from my personal relationships to my career goals to my political views. Travel will change you, so my advice is to make sure you take chances or create your own opportunities to do it! This is a big week for me! This week marks one full year that I have been single–the first full year I’ve been single in my adult life. Between the ages of 19 and 26, I never went more than 2-3 months without a boyfriend or being in some type of dating relationship with a guy. I wouldn’t call myself a serial dater, but I was somewhat of a relationship junkie. There is nothing wrong with being in love and building a relationship with a special person, but for me, I realized that special person needed to be myself for a while. When my last relationship ended around this time last year, my natural instinct was to start dating again immediately. However, I began to realize that this single time was well overdue, and that part of me had been wanting it consistently for the past 7 years. As the months of singledom progressed, I began to realize that I could now make small and big decisions for myself and no one else: where to live, what to do with my free time, who to hang out with, how to spend my money, whether or not to change my career, whether or not to pursue a law degree, where to pursue that degree, where to travel, and how long to travel. 1-Moved into my first “adult” studio apartment solo, bought furniture I liked, and decorated it how I wanted. 2-Started playing guitar again regularly. 3-Trained for and ran a full marathon while raising over $2,000 for St. Jude’s Children’s Hospital in the process, thanks to the generosity of my friends and family! 4-Traveled to Africa solo and camped in the wild. 7-Left my job in finance. 8-Celebrated my best friend’s marriage as her maid of honor. 9-Decided where to go to law school. 10-Planned a 3 month trip to 3 different continents, mostly solo. 11-Started a blog, something I never thought I would do. 12-Proceeded to sell and box up all aforementioned furniture and decorations and move out of dream apartment into storage unit. 13-Embarked on aforementioned trip solo, exploring Southeast Asia and now exploring Peru and Bolivia. 14-Relied more on my friends for support, encouragement, and laughter. In a lot of ways, having a boyfriend made me a lazy friend. I am sure not everyone in a relationship is guilty of this, but I think I certainly was. I now appreciate my (girl and guy) friends more than I ever have, and I feel like (hopefully) I’ve become a better friend now that I have had more energy to pour into my friendships. 15-Used dating as a learning process. Being single doesn’t mean I haven’t been dating. The process of dating in NYC can be exhausting, but it’s helped me realize even more what I absolutely do and do not want in a future partner. So I consider the process to be highly informative and (usually) fun. While I’ve always been independent, this year has made me more confident in my ability to make my own choices about my path in life. Perhaps there will come a time when my goals will align well with someone else’s, and a relationship will be a natural, positive development and not require undue compromise on either part. While I love being single, I am sure I will welcome that time when it comes. For now, I want to enjoy these days of being accountable to and responsible for no one else but myself. And to enjoy these days of jamming out to Beyonce’s “All My Single Ladies”!